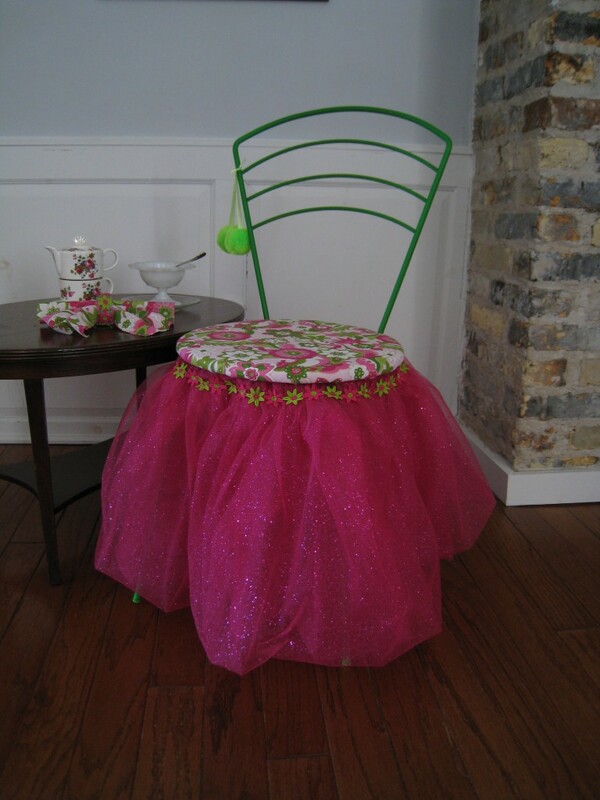 Miss Muffet Never Had a Chair Like This! 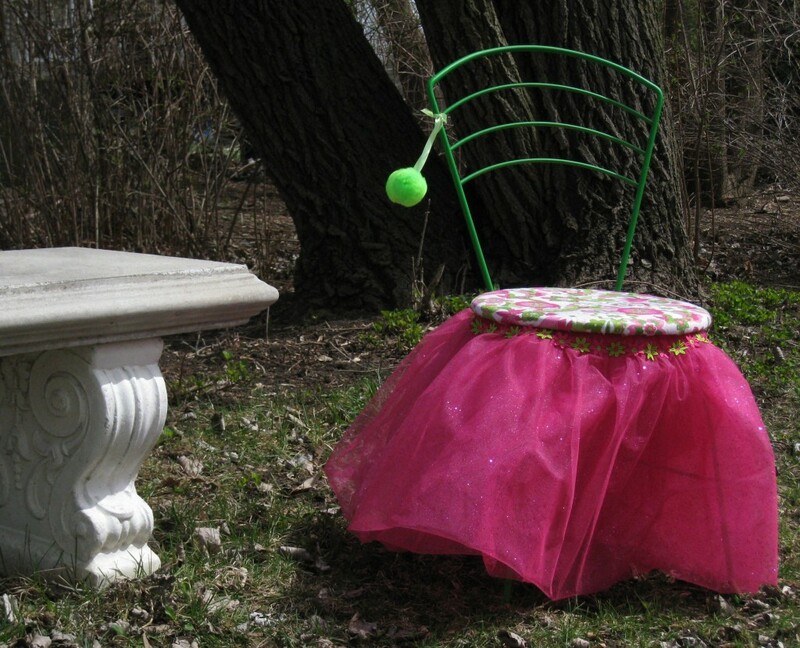 Miss Muffet would be jealous of this fabulous chair! 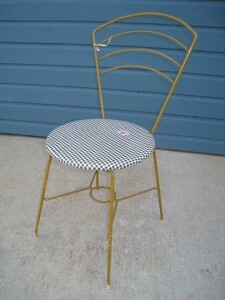 I have had this great little bistro style chair hanging in my shed since last fall. I should say my husband’s shed. I get the house and he gets the shed. He doesn’t touch my “stuff” and I don’t mess with anything in his 4500 square foot garage. It’s the perfect trade off! I do all the interior design at inside and he does all the outside work! 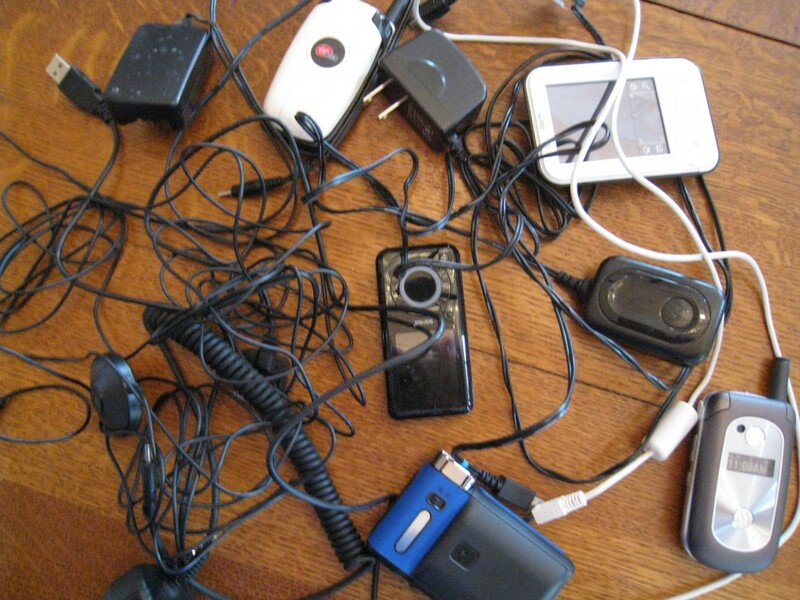 I do, however, store a few items in there once in a while. This chair for instance. It was a great find for $9.99 at Goodwill. 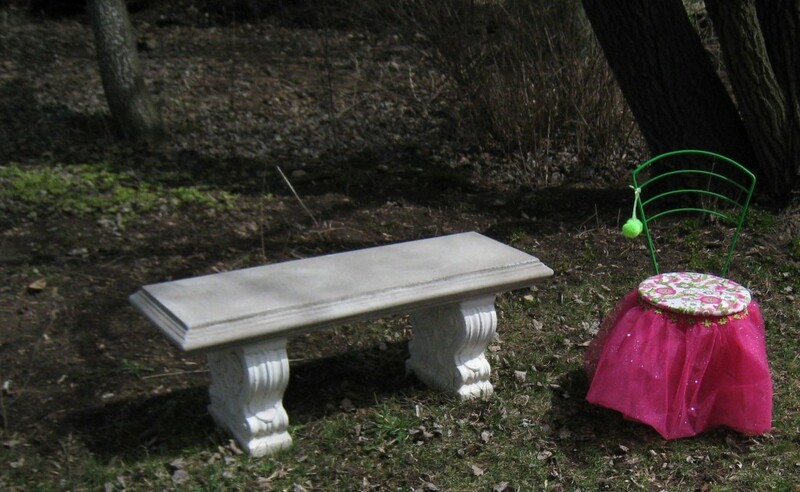 I wanted to do something very girly in hot pink, so my 7 year old niece Kayla became the inspiration and recipient. I knew it would be perfect for a child’s bedroom. 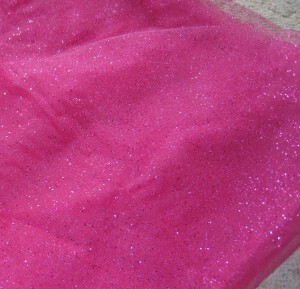 The glitter really sold me on this tulle! 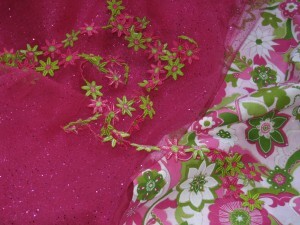 I was very excited when I found this glittered fuchsia tulle and a floral fabric and embroidered trim to go with it. 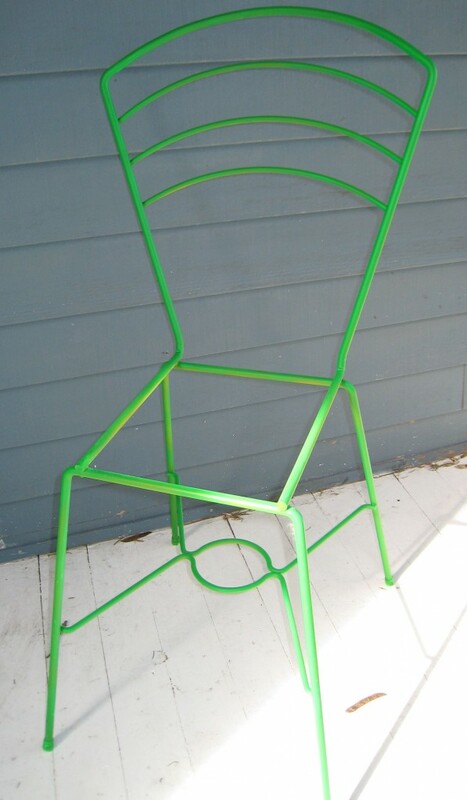 A little sand paper to rough up the finish and a can of neon green spray paint updated the chair from the 1970’s. The old seat batting was in good shape. The black and white vinyl seat was stapled on and easy to remove. 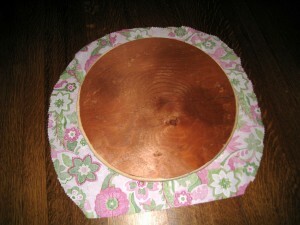 Then I cut a piece of the fabric 2” wider than the seat and attached it with a staple gun. 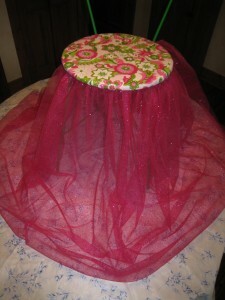 I gathered a double layer of tulle by hand and stapled it to the seat making the gathers even all the way around. 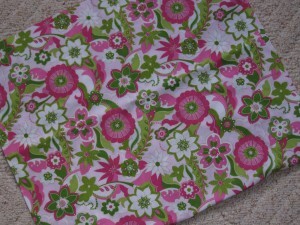 Never cut off the excess fabric until you are satisfied with the fullness. Instead of cutting off the excess netting, I folded it up for extra fullness and sewed it in place. 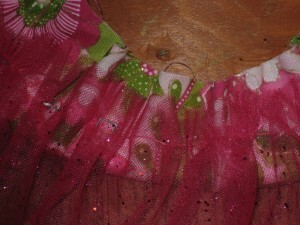 You could glue the trim to the fabric, but hand stitching is neater (no mess) and you have greater control. I happened to find the lime green pom-poms in my stash that were a perfect match. 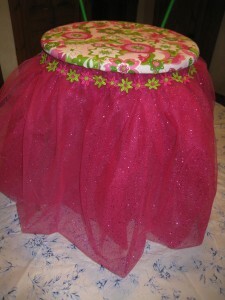 It turned out so cute and just right for a girly little seven year old. 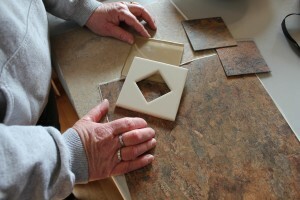 Adding style and design to any room can be as simple as a trip to a resale shop and fabric store. Go ahead, brighten your home with color!